ln step one l do very little other than mark out tough shapes and colors. I use my Caran D’ache Luminance White with a fairly heavy pressure to block in the highlights. The next thing l do is take my Polychromos Ivory, sharpen it really well, then using the heaviest pressure the point will take mark in the fine veins of the eye, embossing them into the paper. I use Holbein Ivory over the lightest part of the iris. I outline the rims and the pupils with Faber Castell Polychromos Dark Indigo. 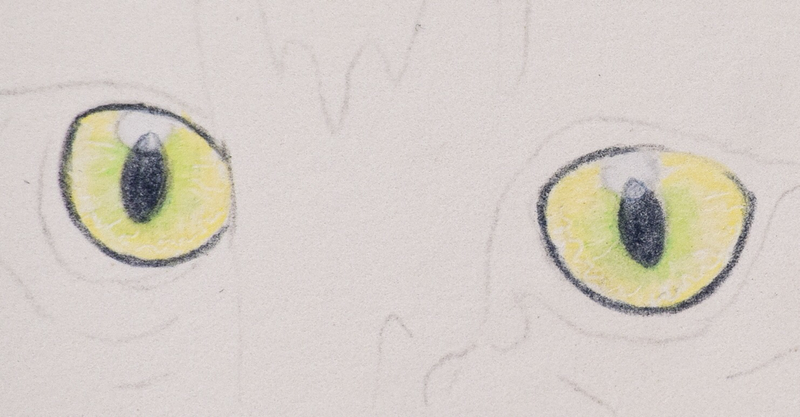 Finally l work over the whole iris with Holbein Cream and add a little Holbein Lettuce Green around the pupils. ln step 2 l start to map out the veins and the shadows. For the shadows and fine markings l use Caran D’ache Pablo’s inApricot and Venetian Red. I mark in the shadow under each vein in the eye with Pablo’s Brownish Orange. If you have embossed those little veins in this is really easy to do. I then work over the whole iris with Holbein Naples Yellow. 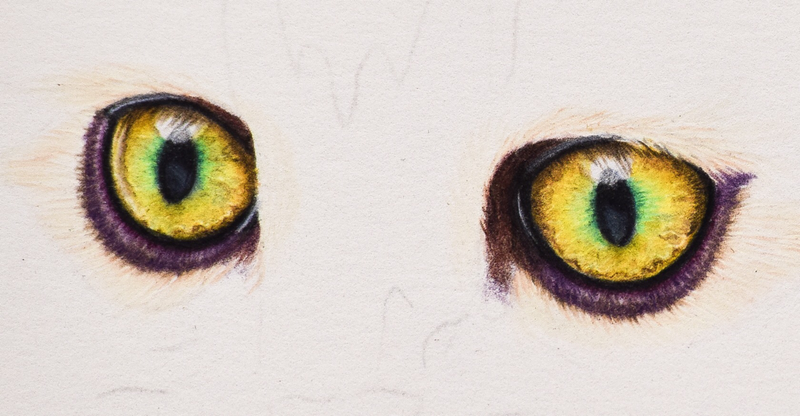 I add to the color around the pupils using Holbein Opal Green and Pablo’s Yellow Green. I layer over the pupils and rims with Polychromos Black. ln step 3 the eyes start to come alive. Now l look really closely at my reference photo to pull out all the colors l can see. I want to add all the little flecks and marks that make the eyes unique. I use Holbein Lemon to brighten the Yellow. I use three more shades of green around the pupils, Pablo’s in Peacock, Veronese Green and Grass Green, these are just teeny tiny specks of color, but they add life and interest. I add some darker markings to the eye with Pablo’s Green Ochre and finally l use some Pablo’s Brown Ochre to begin the shaded parts of the eye and Polychromos Nougat to outline the veins. You can see now how the veins are beginning to look three dimensional. ln step 4 l start to build up the area just around the eye using Holbeins in Sea Fog and Smoke Blue. I add the tiny details to these lilacy rims with Polychromos in Red Violet and Caput Mortem Violet and add depth with Luminance in Violet Brown and Violet Grey. l use Polychromos in Nougat and Dark Sepia to start adding more depth to the shadows and to mark in some of the reflections visible in the highlights. I use Luminance white over the black lower part of the pupils to add some subdued highlights. ln Step 5 l start building the vibrancy adding final colors. I take Holbein Cream over the lighter parts of the iris. I add a little Pablo’s Bluish Green around the pupils. I use Pablo’s Olive Brown to deepen the shadows. I brighten everything with Holbein Lemon. I add more depth to the outer rims with Polychromos Nougat, Caput Mortem and Dark Sepia and Luminance Violet Brown. Finally l add a lot more green. I use Holbein Lettuce Green and Pablo’s Veronese Green and Peacock Green around the pupil. Then l layer over the entire iris with Pablo’s in Bluish Green and Empire Green. The eyes now have more depth to them and are complete.